Cushion cut diamonds combine the appeal of a square cut diamond but with soft, rounded edges, lending this shape a romantic feel. This timeless shape is derived from the old mine cut, and has been refined over hundreds of years. For the first century of its existence was the most popular diamond shape (similar to round cut today). Until the early 20th century, the cushion cut diamond was the de facto diamond shape. Cushion cut diamonds are a beautiful choice for any setting style. One of the rarer and more unique choices, the cushion cut's large facets allow for great light dispersion, giving birth to a much larger range of spectral colors and making for a highly scintillating stone. 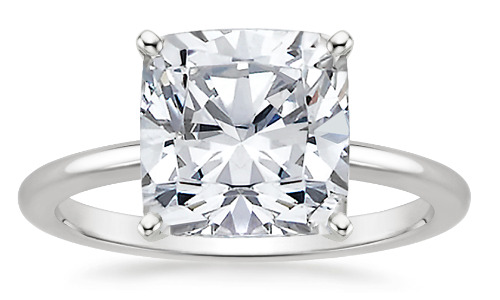 As its name suggests, a cushion cut is a square or rectangular shape with rounded corners that resemble a pillow. The cushion cut is usually comprised of 58 facets with a typical ratio of 1.00 to 1.05 for square shapes and 1.10 or greater for more rectangular ones. Although not as brilliant as round brilliants, cushion cuts have large facets allowing for a greater separation of white light into spectral colors. The cushion cut may be described as a cross between the old mine cut and modern oval shape. 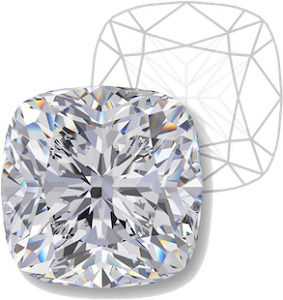 As techniques and cutting styles have evolved over the years, several variations of the cushion cut have been developed, such as the Cushion Modified Brilliant which may have an extra row of facets on the pavilion that alter the look of the diamond. These modified brilliants often have what is called the "sparkling water" or "crushed ice" effect, giving them greater scintillation. Other subtle alterations have also been introduced, such as adding symmetrical kite or half moon shaped facets to the pavilion and below the girdle (see Expert Advice below). Because of its extra facets, the cushion cut can disperse more light through the stone which serves to hide inclusions more efficiently, making it one of the most brilliant of all square and rectangular shaped stones. The Cushion cut diamond is also reknowned for hiding inclusions well. Traditional cushion cut diamonds return light in a chunkier pattern than modern cuts. Combined with the enlarged culet (which was considered desirable for the pattern created when viewed through the table), this created a distinctive look that is prized today among dealers in antique diamonds. Partially based on cut research initiated by Marcel Tolkowsky in the 1920's, refinements to cushion cut diamonds over time (such as shrinking the culet, enlarging the table, and improving cut angles for increased brilliance), have led to a resurgence in popularity. Many buyers are attracted to the antique feel combined with modern performance offered by the cushion cut. The standards for cushion cut vary more than most other shapes, and personal taste will dictate choice. While generally less brilliant than round brilliant diamonds, cushion cut diamonds often have better fire, which is part of their appeal. Modern cushion cuts tend to have one of three basic pavilion facet patterns (see picture). The third pattern has an extra row of facets on the pavilion and is classified by GIA as a "modified" cushion cut. These modified cuts tend to have a "crushed ice" or needle like facet pattern, more similar to a radiant cut than a traditional cushion cut. While the classic cushion cut diamond is a square (with a length to width ratio of 1.00), they are often found in slightly rectangular shapes as well. The most popular shape is a slight rectangle of 1.10-1.20 length to width, however personal preference should dictate choice. The cushion, pillow or candlelight cut was developed in the 19th century and has undergone several transformations and developments since. The cushion cut has especially benefited from the invention of cleaving as this process has helped to maximise the shape's light dispersion making it more dynamic and brilliant.